The Taycan will be assembled near Stuttgart and right next to some Porsche legends: the 718 Boxter and Cayman, and the iconic 911. -The car will be assembled at the historic plant at Zuffenhausen, near Stuttgart, Germany. -The iconic 911, 718 Boxster, and 718 Cayman are assembled there. -Electric cars require completely different materials than a gas car, so things will have to be moved around. -One of the buildings on campus will have to be demolished while all 4 cars will be built at full throttle capacity. -Workers’ wage hike money to be voluntarily used as investment capital to renovate plant. -Porsche intends to build 20,000 Taycans next year. -All eyes are on Porsche as this is arguably but probably the most important car it’s ever built, if you’re willing to put aside emotional sentimentality over the 911. Although they are considered a seasoned blue blooded legacy car maker with over 140 years of history behind them beyond their founding in 1931, Porsche AG's head of production Albrecht Reimold announced that production is on schedule for the second all electric and first production electric Porsche ever to be made, the Taycan, a BEV, Dutch auto publication Vroom, said. Because the car is an electric, it requires a whole different set of materials and methods that are distinctly different than the materials and manufacturing processes used to assemble gas cars. Compounding this problem is that the plant site needs renovation, and a building where production is housed is going to be demolished while all four cars (911, the two 918s, and Taycan) are running at full capacity production. Plant workers are caught in the middle of all this. They will have to make all these cars at the expected quotas, as renovation construction is underway. According to Mr. Reimold, plant workers agreed to voluntarily defer wage increases until 2025 to put that money aside and use it to invest it as finance capital for the renovations at the plant. They are expected to be compensated by 2024 with a payment instead, for their contributions. But being invested also means they have a stake, and Mr. Reimold said workers are committed to keeping the production schedule on time to start Taycan assembly as soon as possible. Building cars is not an easy thing to do, and if anything Porsche’s problems putting the Taycan into production prove that Tesla’s production issues are not unique to them either. Although an electric car has less components and less moving parts, it's still a car, and some components are hard to get elsewhere, specifically those made of materials that are either scarce or rare on earth and/or are in heavy demand by both competitors and other industries at home and markets abroad. Car makers are trying to find work around solutions to these problems by doing things like stockpiling, building their own parts factories, in this case battery factories, and buying businesses that can help them get access or make whatever it is that’s hard to come by. Porsche has a lot at stake with the Taycan rollout. The company professed that maybe next to the 911, the Taycan may be the most important car Porsche has ever built, and they’re treating it that way for several very important recent reasons. Porsche AG recently discovered that its founder, Dr. Ferdinand Porsche, an Austrian electrical engineer, not a mechanical one, built himself the first Porsche ever made back in 1898: the P1. It looks like a giant horse wagon made mostly out of wood, but like all Porsches that succeeded it as this example is a royal ancestor, it rides faster than a trip to hell. Dr. Porsche then locally raced the car himself, and won first place that the second place recipient didn’t pass the finish line until later in the afternoon. It was a typical boring race with a Porsche as an entrant, and a preview of what was to come in the 20th century. It was a barn find never to forget. Dr. Porsche’s car was found last year in an Austrian barn intact after being in there for over 130 years. And no one at the company knew of this. The car is undergoing restoration to be displayed at the Porsche Museum. And with that car, Porsche’s entry into the electrical segment takes a whole new different meaning, and makes their role a game changer. Some say it is no longer Tesla that sets the standard of what an electrical car is, that role by legacy and heritage and a blue blooded one at that, belongs to Porsche. They now assume a leadership role in the electrical segment among the other legacy car makers, and an electrical leadership role in the entire auto industry. Porsche now has something that Tesla Inc. will never have, a racing heritage of both gas and electric vehicles, and the storied heritage of a company that started with an electric car as its first 130 years ago. It’s almost like the Holy Grail. So Porsche has to get this car right. The stakes may not be like the insolvency issues Tesla is facing with Model 3. Taycan's wait-list should avoid Tesla Model 3's problems, but Porsche has a lot at more at stake in their reputation, history, and heritage, as they now are considered the lead car company presenting the legacy industry’s official response to Tesla. Even as Jaguar has beaten Porsche to market with their EV car, it’s all about Porsche, and how their car will compare to the Palo Alto company's lineup. And Porsche has made it clear it will electrify their way and when they’re ready. 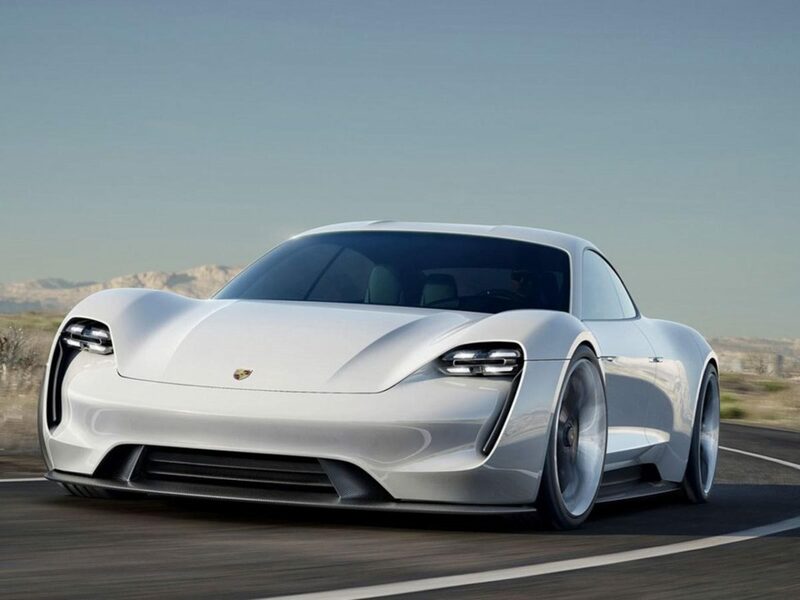 The electric car now belongs to them by birthright as well, some say, and development will ensure the final product is truly a Porsche the way their other products are made. The company has an impressive history with electrics and sports cars. First EV First Hybrid and A Mercedes 911? Dr. Porsche is the first known person to invent the world’s first gasoline electric hybrid vehicle. The system was installed in a Volkswagen Beetle. The company was founded in 1931 after Dr. Porsche, who was then an engineer for Daimler Benz, submitted a new car proposal for a light weight, rear flat square engined, rear wheel drive sports car for even weight distribution, and for an optimal power to weight ratio, that Daimler’s board of directors rejected. We could only imagine what a Mercedes Benz 911 would be like had they approved. With that rejection, Daimler set Dr. Porsche on his way to become a man on a journey with destiny. The rest is history. Porsche spent years developing Taycan so that it can perform well in all aspects like a Porsche, particularly a gas one. This car must be able to sustain hours of long distance prolonged high speed driving on venues such as the Autobahn, that when it needs a recharge it can pull up into a recharging station and fast charge. Prolonged high speeds and fast charging are the two most extreme conditions you can subject an EV car battery to with the hottest temperatures, and with both circumstances together the car must still perform effortlessly. It must be able to do this and keep its battery pack as cool as possible within normal operating range, and resume high speeds on the interstate immediately after fast recharging, something that is extremely difficult to get an EV to do, and one of the main reasons car makers were hesitant to invest themselves in electric cars. Sources are reporting Porsche is compiling a reservation list of customers and they intend to keep on schedule to have a dealer rollout one year from now. Stay tuned to Torque News to hear the latest developments on Porsche’s progress toward production of the historic BEV Porsche Taycan sports sedan. Give us your thoughts below in the comments section.